Today was Craig's first day back at work after the Christmas holidays. I assumed I'd be productive, but my assumption couldn't have been further off. I've done nothing today. My brain wont focus. I tried to read; that didn't work. I have a whole list of things I need to do around the house; I've done none of them today. Something about this waiting game, waiting for baby to arrive who knows when, is making my brain feel like mush. I am so excited, nervous, and anxious! I want Baby to come early because, let's face it, no woman is comfortable at 36+3, but I also want my mom's wish to come true and Baby to wait til she arrives in England. Thank God I'm not in control of the timing! 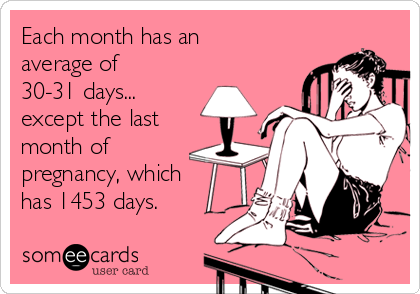 But, my goodness, how slow this month feels already! Lord, I pray that You would strengthen me this month. Help me not to be too anxious, but help me to trust in Your perfect timing. I also pray that You would give me a smooth, pain-free labor. I know You have the ability to do that and I ask that You would. Also, please remove all the fear and worry from my mind. Thank You for the blessing of pregnancy and I pray that You would grow me and Craig as we become parents. Help us to raise our child to love and serve You. Amen. This entry was posted on Jan 5, 2015 and is filed under Faith , Life , Pregnancy . You can follow any responses to this entry through the RSS 2.0 . You can leave a response .